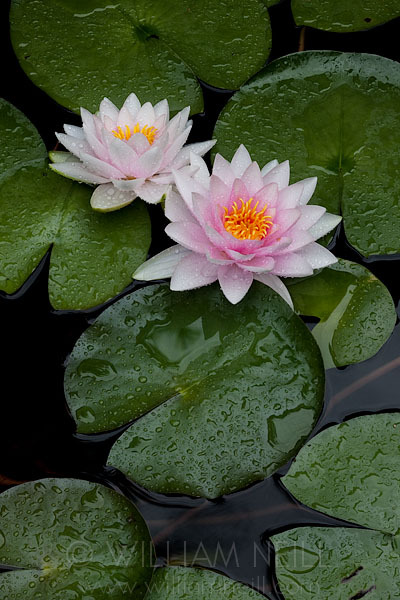 I have a small pond adjacent to my backyard patio, and the lilies are in bloom! I made this image on Sunday, using two frames stitched together in Photoshop CS5. 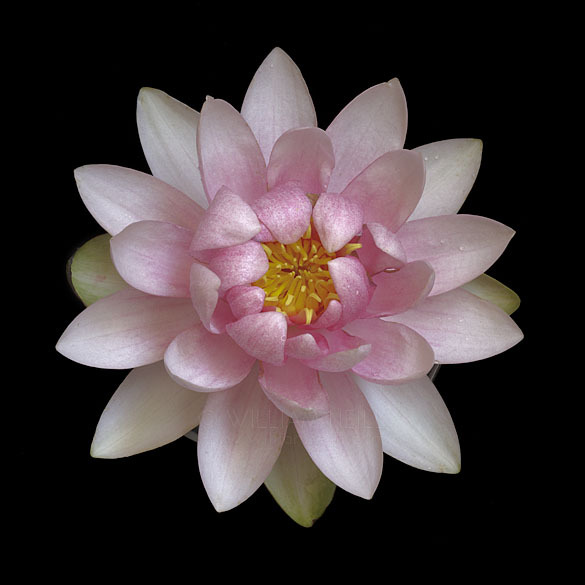 To fulfill my concept, I cut the flower, then placed it in a small bowl of water which in turn was placed on black velvet. Aiming straight down, I “shifted” my Canon TS 90mm lens to include two halves of the flower in two separate exposures. This techniques allows me to create a square format with Photomerge, which suits this flower shape to me. It also gives me a bigger file: PS Image Size reads this file as 206 MB. On Sunday, we had rain. Unusual for August. Here is an image from the many frames I made. Given the brown and dry surroundings of my backyard, I enjoyed this lushness! I hope that you are enjoying the new blog! Tomorrow I have another One-on-One workshop. Have a good weekend. Welcome to my new PhotoBlog! As you can see, my new photoblog is up and running! The blog now matches/blends in with the new web design. My goals are the same – to share my thoughts on landscape and nature photography in general, as well as sharing information specific to my own photography. I will continue to include links to the work by other photographers I find inspiring, plus products and resources that I find useful. Please update your bookmarks, RSS feeds, etc. 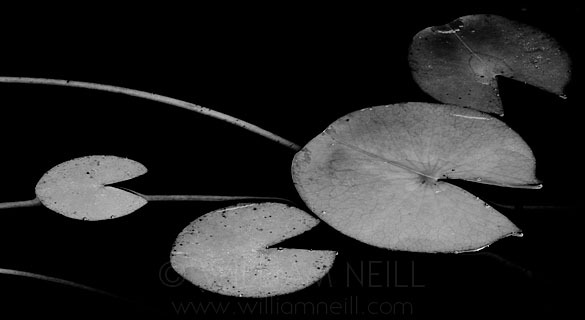 The photo included was made in my backyard pond. When I noticed the pattern that the pads form, I visualized a B&W photo. This was unusual for me, but since John and I developed the Meditations in Monochrome ebook, I am “seeing” in B&W more often. I also made dozens of color frames on Saturday and Sunday. Sunday was especially good since it rained here! I look forward to your comments and feedback. Be sure to “follow” me on Facebook, LinkedIn or Twitter too! $5ea. Or get all 4 for $15! Click here for more information and to visit the William Neill eBook store! 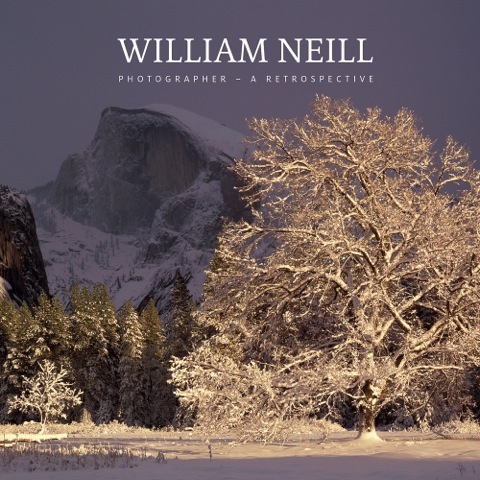 William Neill's Yosemite Volume One App on iTunes!! 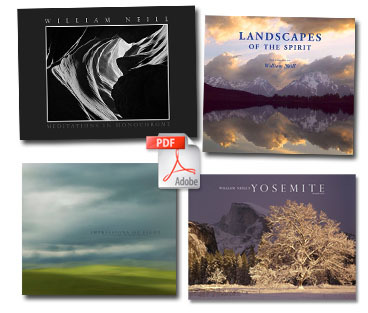 ON LANDSCAPE essays from OUTDOOR PHOTOGRAPHER Ansel Adams Award Winner William Neill offers instruction and inspiration in On Landscape.